If you suspect your child suffers from “summer brain drain,” you have research on your side. According to a study at Duke University by education and psychology professor Harris Cooper, Ph.D., test scores show that, on average, kids have lost at least one month of learning when they return to school in the fall. Many kids who finish their academic work successfully in June come back to school in the fall needing to repeat the last month of work completed in the spring. Luckily, there are lots of low- and no-cost ways to keep your child engaged in learning this summer while having fun outside — giving them a running start when school begins this fall. Clay Heilman, president of Nature Vision, a Redmond nonprofit organization that provides school programs for learning about the environment, says that being outdoors can enhance a child’s learning potential. “When we take them outside as part of their education, everyone wins,” he says. Becca Hall is director of Summer Winds Day Camp in Snoqualmie, where, since 2000, kids have enjoyed playing and learning outdoors. The camp incorporates nature into every activity, including art projects, building forts, making and sailing toy boats, and exploring the surrounding forest. 1. Make art outside. Planet Happy Kids near University Village is a great resource for art supplies and craft kits that are fun to use outside, including crayon rocks. 2. Have fun with math. Count rocks, stairs or cedar trees with your younger kids. Look for groups of shells or rocks at the beach (“Let’s count just the clamshells!”). Explore fractions at picnics (“We’ve got one cake and we need to share it with 20 people. How should we cut it up?”). 3. Make some money and learn about economics. 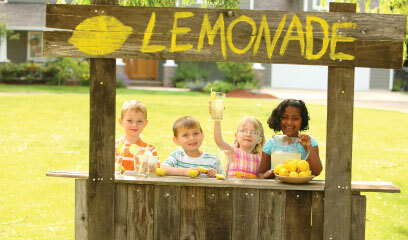 Help your kids set up a lemonade stand and let them create the advertising and make change. Hold a garage sale and let the kids price the stuff — and change the prices if sales are slow or some things sell in an instant. 5. Plant a garden. There are so many learning opportunities when kids grow a giant pumpkin or sunflower from a seed. Let older kids plant their own garden bed. Teenagers might enjoy setting up a compost bin or rain-barrel system. 6. Take your kids to your local farmers’ market and encourage them to talk to the sellers about what they are selling, how they figure out what price to set, how the weather impacts their crop and, if they are selling organic produce, how that is different from “conventional” produce. 7. Go for a hike. Do your research first so you choose a hike that won’t totally exhaust a toddler; let older kids choose the hike using guide books as a reference and consider letting teens “hike ahead” (with proper emergency gear) and meet you at a designated spot. Joan Burton’s book Best Hikes with Children — Western Washington and the Cascades is a great resource. She includes detailed information so you can make the hike educational as well as fun. 8. Teach your child to fish, or learn together. My own most vivid childhood biology lessons occurred while learning to fish with my father. The Issaquah Salmon Hatchery is a great resource for learning about salmon if your kids prefer to watch fish, not catch them (issaquahfish.org). 9. Have your kids read about places you are going to visit on summer vacation and let them help plan the itinerary based on their research. 11. Build a tree house together. Have a certified arborist help you select the right tree. Your kids can help you with the design and construction phase, and will learn a great deal and have a wonderful place to play for years to come. Need inspiration? Read The Treehouse Book by Fall City’s master tree-house builders Peter and Judy Nelson. No big trees? You can also give your kids some tarps, rope and outdoor chairs to create a simple outdoor play structure. 12. Make your backyard a wildlife sanctuary. 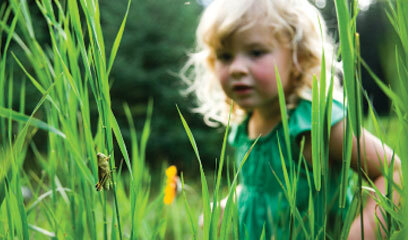 Practice environmentally kind lawn and garden care. Put out a bird feeder and a water source for birds. Get a bird identification card (REI sells them) and keep track of how many different species of birds you and your kids can spot during the summer. Kathleen F. Miller is a Sammamish-based freelance writer. Her kids will be hiking, painting outside, learning catch-and-release fly fishing, and growing pumpkins and sunflowers this summer. Kathleen F. Miller is a Sammamish-based mother of two. She is a Northwest native, raised on Bainbridge Island and a loyal University of Washington Husky. When not teaching art, volunteering or writing about parenting, health, green living or travel, she can be found at the Marymoor dog park racing after her giant black dog, Lottie.